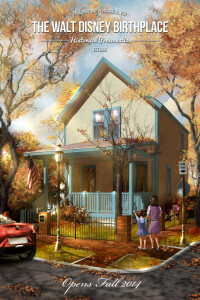 The Walt Disney Birthplace kicked off its “Start Some Good” fundraising campaign on Tuesday, October 21, 2014 and will run until Walt Disney’s birthday on December 5, 2014. The fundraiser, www.startsomegood.com/WDB, will support costs associated with the Phase one exterior restoration efforts. A variety of special events will also be a part of the campaign. Walt Disney fans worldwide are rejoicing that the landmark home in Chicago, IL where Walt and Roy Disney were born has been privately purchased and is in the process of being restored. The modest home, built in 1893 by Elias and Flora Disney for their growing family, will become a museum and cultural space. The target date for completion of Phase 1 of the exterior restoration is December 2014. The restored birthplace will also be the corporate home for The Center for Early Childhood Creativity and Innovation (CECCI), a 501(c)(3) non-profit, which is dedicated to nurturing creativity and innovative thinking in children ages 6 months to 12. The goal is to share Walt Disney’s life as an inspirational message that children’s dreams can come true through the magic of their own imagination. Through providing artistic vision and development, CECCI will become a major creative platform for children everywhere. Supporters of this Start Some Good campaign will receive special rewards including t-shirts, hats, limited-edition posters, dedicated paver stones outside the restored home, and more. Items will be available in time to make great holiday gifts. The Walt Disney Birthplace foundation and CECCI are a California public benefit 501c3 pending federal status. Contributions are eligible for tax deductibility. The Walt Disney Birthplace and CECCI are not affiliated, associated, authorized, endorsed by, or in any way officially connected with The Walt Disney Company, Disney Enterprises, Inc., or any of its subsidiaries or its affiliates. Reference to Walt Disney and their trademarks is used purely for historical reference and informational purposes. 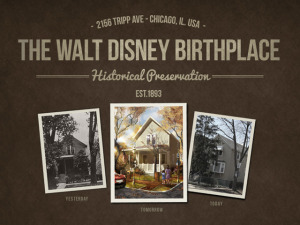 For more news and information about the Walt Disney Birthplace restoration, please visit http://www.TheWaltDisneyBirthplace.org. This entry was posted in Home Page, Home Page Slider, News and tagged Brent Young, Start Some Good, Todd Regan, Walt Disney Birthplace. Bookmark the permalink.